This Tamil New Year, there is a sweet news about a sweet couple - Sneha and Prasanna. The pair expecting their first child, Prasanna has tweeted that Sneha is pregnant and the new member will join very soon. 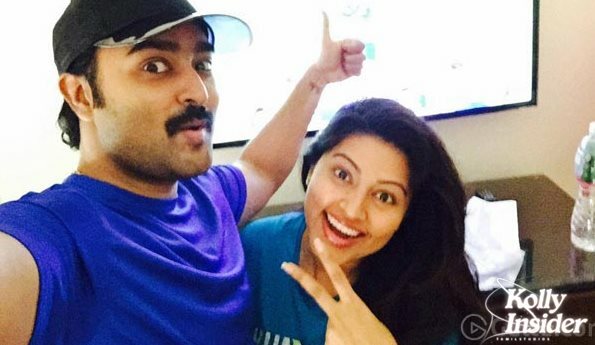 Actress Sneha and her husband, Prasanna are expecting their first child, if the latest reports are anything to go by. Ever since she got married to actor Prasanna, back in 2012, rumours about her pregnancy have been flying thick and fast on regular intervals. In fact, last year, when such rumours surfaced once again, Sneha confessed that they weren't prepared for parenthood yet and that she wanted to concentrate on her career for the time being. "On this special day am extremely happy to share a good news with you all. We are awaiting a new member in the family. Very soon (sic)." As soon as the news broke out, the duo was flooded with congratulatory messages from their friends and fans on social networking sites. After making her debut in Priyamaina Neeku back in 2001, Sneha went on to act in films like Venky, Hanuman Junction, Sankranthi, Sri Ramadasu, Pandurangadu, Rajanna and Ulavacharu Biryani, where she shared screen space with the likes of Ravi Teja, Allu Arjun, Venkatesh, Balakrishna, Upendra and Nagarjuna, apart from acting in a slew of Tamil films. Kollyinsider wishes the couple a great new year and tonnes of wishes for the good news they have shared. Soon here we will have another dazzling mom and dad. Congratulations Sneha and Prasanna!